← The Sports Archives – Healthcare After College Sports: No Slam Dunk for Aging Athletes! The Sports Archives – Denver’s Top Sporting Mascots! The Mile-High City has rather more than its fair share of professional-level and top college sports teams. As such, it is easily one of the most mascot-saturated cities in America. What many people don’t know is that these mascots actually have names and mascot, as well as long and sometimes turbulent histories that make them just as interesting as the teams they represent. 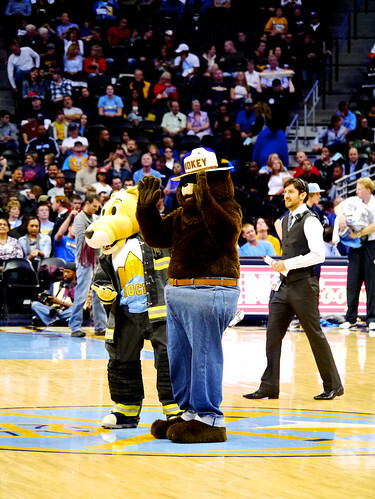 Here are seven of the most popular mascots in Denver! Rocky the Mountain Lion, the mascot for the Denver Nuggets, is easily the most beloved icons in all of Denver’s sports. He has participated in over 1,000 games and as well-known for his off-court ambassadorial role and community service as for his notorious backwards half-court shot, which he once successfully made in nine consecutive games, the longest streak for this shot ever recorded. Rocky was inducted into the Mascot Hall of Fame in 2013 by Shaquille O’Neal and comedian Nick Cannon. In early 2014, Rocky gave fans quite a scare when he reportedly passed out while being lowered to the court as part of the season opener. He was checked out by medical staff and missed the rest of that game, but returned in typical bouncy fashion for the next one. The beloved stallion currently bearing the name “Thunder” is the third to represent the Denver Broncos since 2004, and is always a fan favorite. 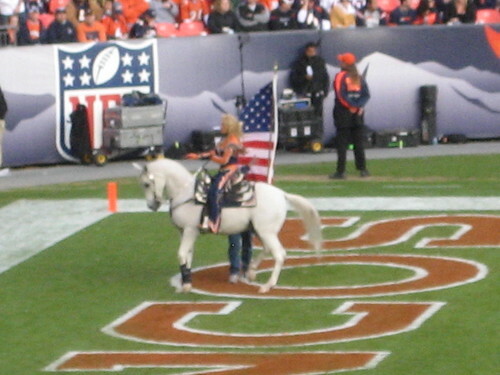 For the 2014 Super Bowl, Thunder was flown via Federal Express with his trainer, Ann Judge-Wegener, to New Jersey for the clash between the Broncos and the Seattle Seahawks. In an NFL first, he and Ann led the team through the tunnel and onto the field for the pre-game introductions. Thunder is the only mascot to appear on this list who is an actual, live animal. 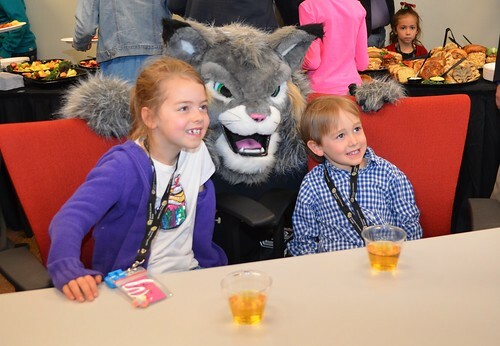 There’s no question that Milo the Lynx, the mascot of Colorado University at Denver, means business whenever he shows up to an event. His menacing, bared-fanged visage and his court-side antics have been thrilling students and athletes alike since February of 2013, when he was officially unveiled. Named in a clever pun on Denver’s nom de guerre, Milo became an instant celebrity on the CU campus and an overnight icon who strikes fear in the hearts of all CU’s opponents. Milo is the second newest mascot to grace Denver’s sports scene; only Gill the Cutthroat is younger. The mascot for the Denver Cutthroats hockey club, Gill has become an instant crowd-pleaser with his game-time antics. Gill is also the latest addition to this list, joining the newly formed franchise in the summer of 2013. Gill was named by fans, who took to social media to vote on his name. In retrospect, the fans couldn’t have made a more perfect choice for this kid-friendly, fun mascot. Perhaps no other mascot on this list has been so wracked with controversy as Denver University’s short-lived “Ruckus,” who took over from Denver Boone in 2008 amid charges that the long-standing Pioneer mascot, originally drawn by none other than Walt Disney, was too racially charged to represent a diverse institution of higher education. 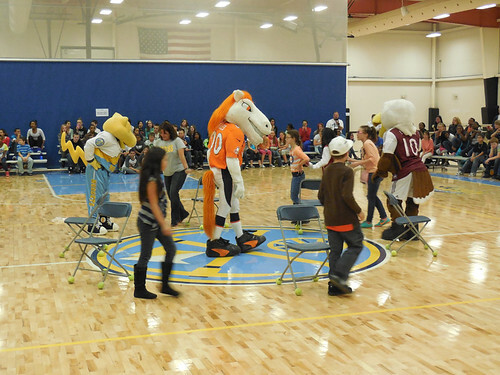 Between difficulties creating an association between a red-tailed hawk and the Pioneer name of the student body, and the university’s student body’s sense of tradition, Denver Boone and Ruckus have sometimes shared mascot duties, making the “ruckus” between Ruckus and Boone one of the most contentious and politically-charged in sports history. 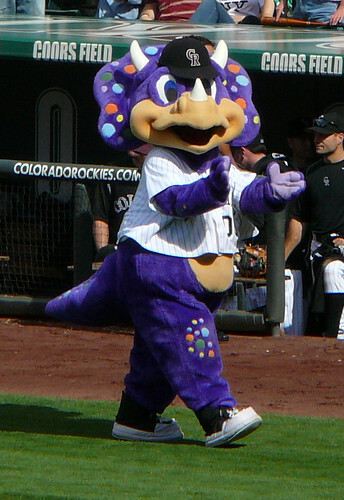 A purple triceratops with a relentlessly friendly grin, Dinger took on the duties of the Colorado Rockies baseball club’s mascot in 1994. Playing off the discovery of a dinosaur rib under the Rockies’ home field, which was then under construction, the franchise invited fans at the Denver Museum of Natural History to name the egg. Dinger won, and he’s been enchanting and delighting fans ever since. Joe Tripsis works at Denver Bison Trailers and is a huge Denver Broncos Football fan. Having grown up in Broncos Country Joe remembers two things about his childhood; spending his days working on his father’s ranch, and hanging with his Dad at old Mile High Stadium. Now Joe can be heard guest starring on the Denver Sports Fancast. What Makes American Sport Such a Spectacle? The Storied History of Denver Bronco’s Quarterbacks! This entry was posted in Baseball, Basketball, College Basketball, College Football, Football, Hockey, Other and tagged 2014 Super Bowl, Ann Judge-Wegener, Baseball, Basketball, blogs about mascots, colorado, denver, Denver Broncos, Denver Museum of Natural History, Denver Nuggets, Denver sports mascots, Dinger the purple triceratops, football, Gill the Cutthroat, Mascot Hall of Fame, Mascots, Miles the mascot, Milo the Lynx, Nick Cannon, Rocky the Mountain Lion, Ruckus the Red-Tailed Hawk, Shaquille O'Neal, social media, sports, sports and leisure, Sports Archives, Sports Blogs, Thunder the stallion, Walt Disney. Bookmark the permalink.